Bio/Neuro Psychology Summary No time to read the book? This summary contains all relevant information in simple language. Bullet points, easy to read, no annoying comments! 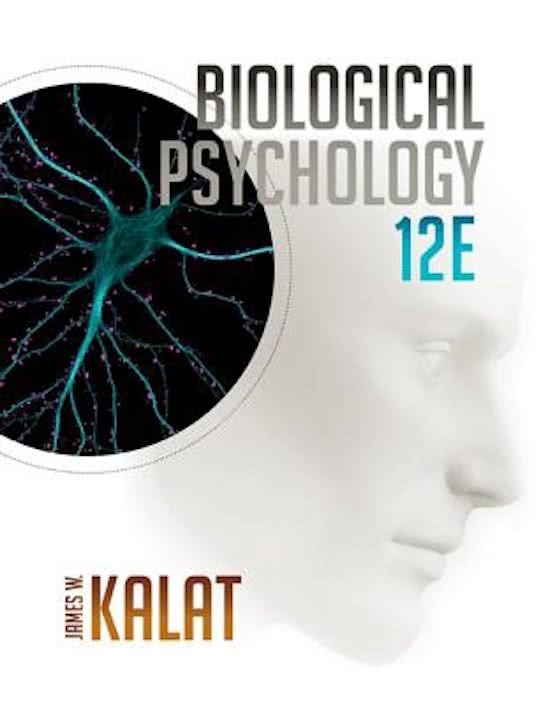 Samenvatting Biological Psychology - James W. Kalat Samenvatting 12th edition Ch1-7 Summary of chapters 1 to 7 of the book 'Biological psychology' by James W. Kalat the 12th edition. Written entirely in English. Samenvatting Biological Psychology - James W. Kalat Samenvatting 12th edition Ch.8-14 Summary of chapters 8 to 14 of the book 'Biological psychology' by James W. Kalat the 12th edition. Written entirely in English. Summary Biopsychology & Neuropsychology This is the summary of the 4th Block IBP course Biopsychology and Neuropsychology. It contains all required chapters from the course book \'Biological Psychology\' and moreover, relevant contents from the lectures and the lecture slides. Biologische Psychologie Engels Samenvatting Biologische psychologie in het Engels. De Nederlandse versie heb ik ook geüpload. Pyc4813 all sections questions and answers This document includes section a, b and c questions worked out in relation to mindtap, recommended readings and prescribed book. It includes some answers of prescribed list of questions as set by lecturers. Also, some answers could be found in previous years' papers. Worked out for 2017 Oct/Nov examination. Pyc4813 Part 1 of exam questions worked out Part 1 of pyc4813 examination questions worked out according to lecturers' prescribed questions and according to past papers. Information is used in conjunction with mindtap articles,prescribed book and recommended reading. 2017. Sur cette page, tu trouveras des résumés, des guides de révision et bien plus de livres de révision Biological Psychology, écrits par James W. Kalat & James W Kalat. Les résumés sont écrits par les étudiants eux- mêmes, ce qui te donne les meilleurs renseignements sur ce qui est important de réviser dans ce livre. Les sujets tels que Biological psychology, Biopsychologie, Biopsychology, 12e editie, biopsychology, Biopsychologie samenvatting, Kalat & summary seront traités.